The nineteenth issue of the 2016 and 2017 Hugo Award-winning Uncanny Magazine will be available on November 7. Hugo Award-winning Publishers/Editors-in-Chief Lynne M. Thomas and Michael Damian Thomas are proud to present the nineteenth issue of their 2016 and 2017 Hugo Award-winning online science fiction and fantasy magazine, featuring passionate SF/F fiction and poetry, gorgeous prose, provocative nonfiction, and a deep investment in the diverse SF/F culture, along with a Parsec Award-winning monthly podcast featuring a story, poem, and interview from that issue. Stories from Uncanny Magazine have been finalists or winners of Hugo, Nebula, Locus, and World Fantasy Awards. Uncanny’s free online content will be released in two stages, half on the day of release, November 7, and half on December 5. 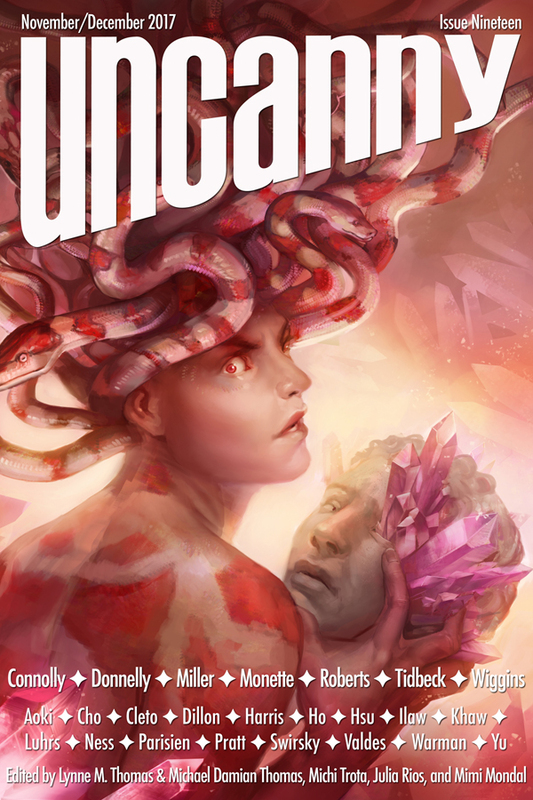 This issue begins the fourth year of Uncanny Magazine, which recently completed its fourth Kickstarter, funding Uncanny Magazine Issues 19-24. Julia is simply a most excellent human being, and one of the best editors in the industry. (Watch what she does as Fiction Editor at Fireside Magazine!). We greatly miss her already. As previously announced, this is the first issue for new Reprint Editor, Mimi Mondal (Mimi takes over as Poetry Editor next issue) and new interviewer Shana DuBois. Stephanie Malia Morris is also joining Uncanny Magazine as a regular reader for the Uncanny Magazine Podcast. This entry was posted in Like Show Business and tagged Uncanny by Mike Glyer. Bookmark the permalink.